Every person is born with the need to be recognized and rewarded. 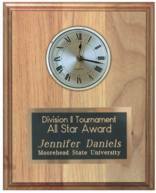 Clocks are the perfect way to reward exceptional people and inspire them to be their best. 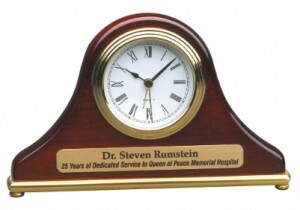 Incredible Engravings, Inc. offers a wide variety of clocks that can be personalized. Custom clocks are also available. 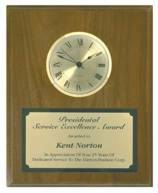 Browse our site and contact us for personal attention on your clock award order. Don’t want to search? E-mail us your requirements and details, including, quantity, budget and date needed and we will find clocks especially for your event or award. We excel at exceptional customer service. 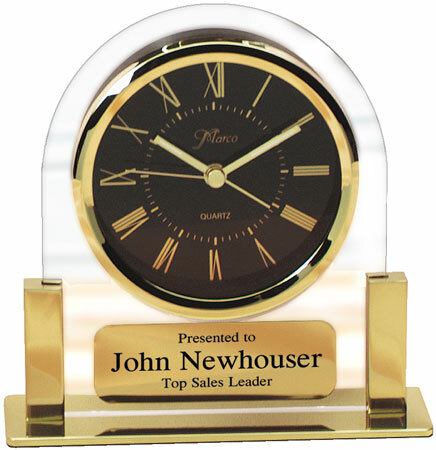 Browse our best selling acrylic clocks. 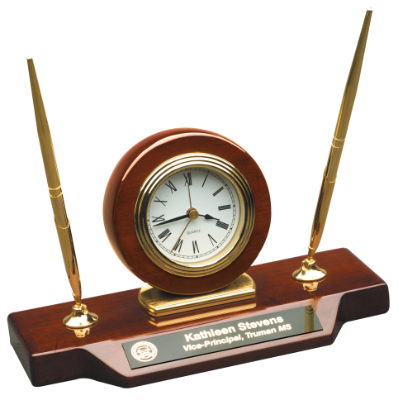 Contact us with the Clock Number and Clock Style you like. We’ll help with wording and details. (Listed prices do not include set up fees). Only need one or less then minimum? Look at this online catalog. Please note the Clock Number and style and contact us for ordering. 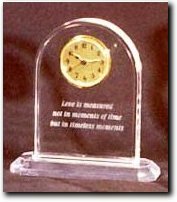 Clocks can be made out of many of our acrylic shapes for a lifetime of beautiful memories. 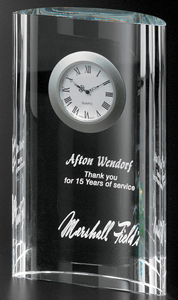 Clocks can be laser engraved directly into the acrylic or on an attachable plate. They definitely will not be stuck in a closet! 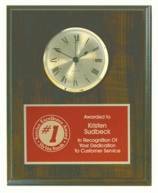 Contact us to see what acrylic shape and clock face would suit your clock gift or award. 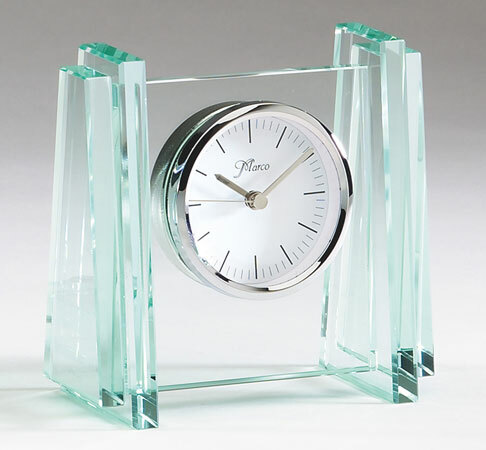 See our best selling Glass clocks here. Listed prices do not include set up fees. Contact us with the Clock Number and Clock Style you like. We’ll help with wording and details. 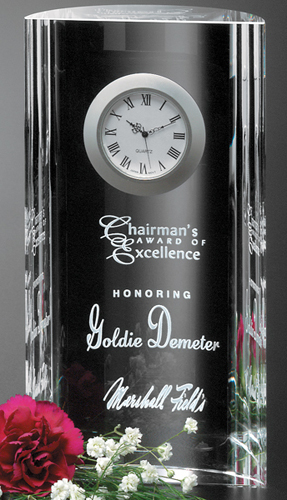 Elegant Glass clocks make unforgettable gifts and awards. 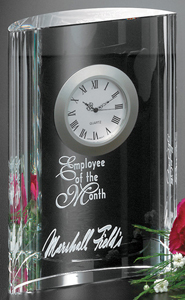 Featured elegant glass clock with precision quartz movement, individually boxed. Overall size 5” x 5” x 2 1/5” Includes personalized plate and batteries. Crystal Clocks . . .When you want the very best. This type of crystal is the finest in the world. Some designs are exclusive. Set up charges will be incurred. Once you see what you like, contact us for personal service. View more exquisite clock options here. 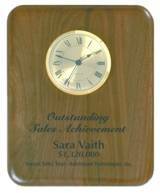 Looking for silver clocks or clocks out of the ordinary? 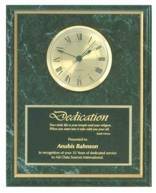 Browse some of our more unique clocks here. (Set up charges will be incurred). 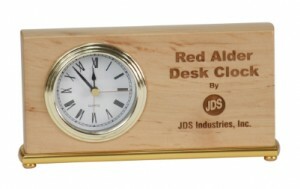 Desk Clocks – Traditional desk clocks made excellent employee recognition and retirement gifts. 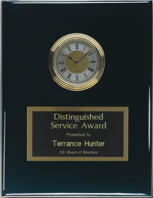 Wall clocks make beautiful award that make a lasting impression. 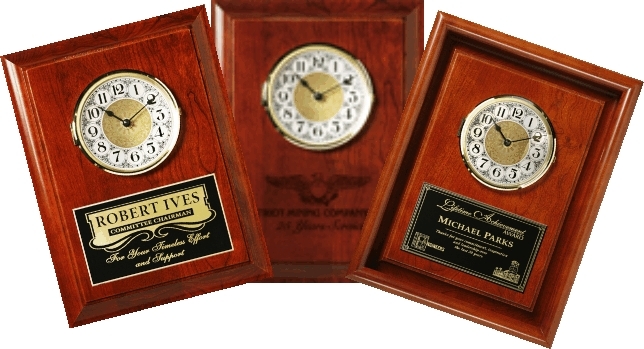 Award Clocks come assembled with personalized plate in a foam pouch. All our clocks include batteries. We’ll even set the time for you! 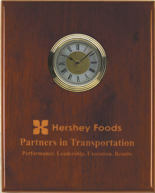 Looking for American Made wall clocks? We have them! Make your selection and contact us for personal service.